A discussion paper describing the outcomes of this collaborative process in detail is available here. 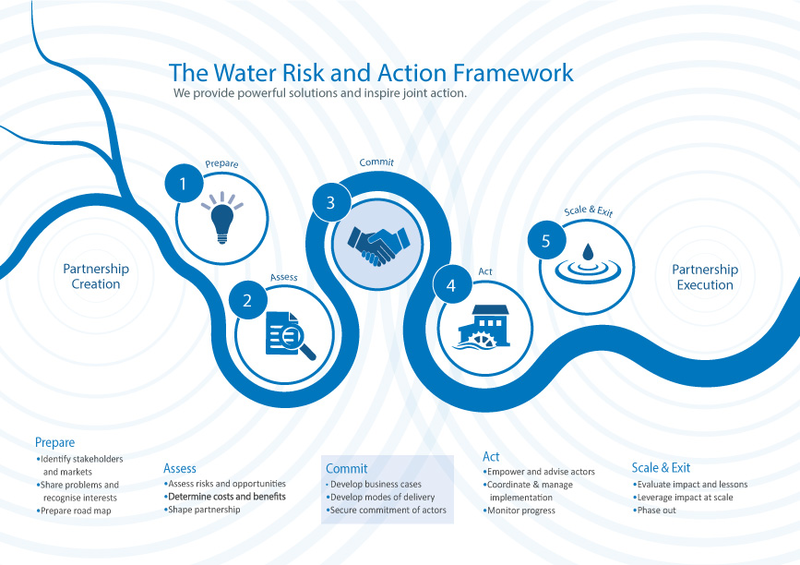 As corporate water assessment tools and stewardship initiatives continue to emerge and their underlying approaches and methodologies evolve, there has been a proliferation of sometimes conflicting interpretations and uses of key terms, such as water scarcity, stress, and risk, often used to indicate geographic locations where water-related challenges are more pronounced. As part of the development of these Corporate Water Disclosure Guidelines, the CEO Water Mandate began a dialogue with several other organizations to come to a shared understanding of these terms where possible. Below is a description and illustration of how these terms relate to one another. Water scarcity refers to the volumetric abundance, or lack thereof, of freshwater resources. Scarcity is human driven; it is a function of the volume of human water consumption relative to the volume of water resources in a given area. As such, an arid region with very little water, but no human water consumption would not be considered scarce, but rather “arid.” Water scarcity is a physical, objective reality that can be measured consistently across regions and over time. Water scarcity reflects the physical abundance of freshwater rather than whether that water is suitable for use. For instance, a region may have abundant water resources (and thus not be considered water scarce), but have such severe pollution that those supplies are unfit for human or ecological uses. The ability, or lack thereof, to meet human and ecological demand for freshwater. 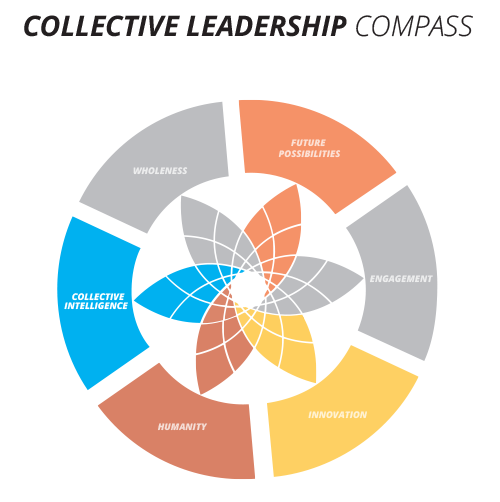 Compared to scarcity, water stress is a more inclusive and broader concept. It considers several physical aspects related to water resources, including water availability, water quality, and the accessibility of water (i.e., whether people are able to make use of physically available water supplies), which is often a function of the sufficiency of infrastructure and the affordability of water, among other things. Both water consumption and water withdrawals provide useful information that offers insight into relative water stress. There are a variety of physical pressures related to water, such as flooding and drought, that are not included in the notion of water stress. Water stress has subjective elements and is assessed differently depending on societal values. For example, societies may have different thresholds for what constitutes sufficiently clean drinking water or the appropriate level of environmental water requirements to be afforded to freshwater ecosystems, and thus assess stress differently. 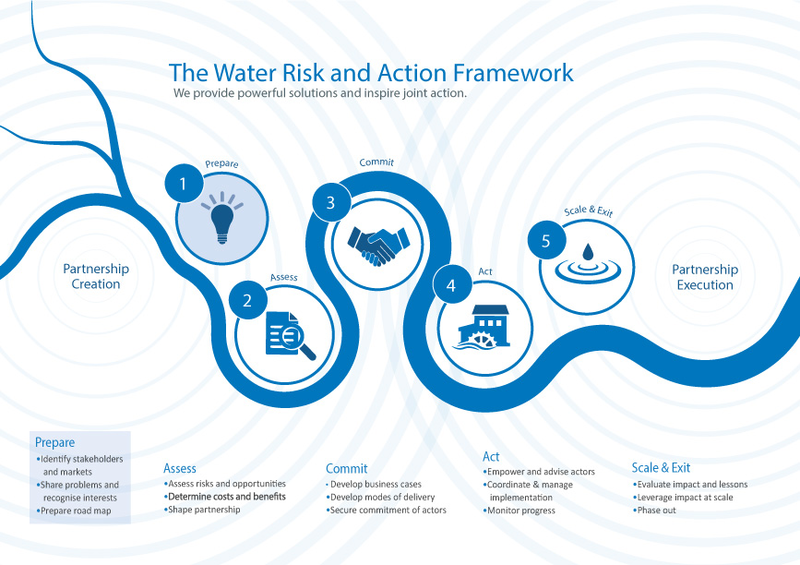 The possibility of an entity experiencing a water-related challenge (e.g., water scarcity, water stress, flooding, infrastructure decay, drought). The extent of risk is a function of the likelihood of a specific challenge occurring and the severity of the challenge’s impact. The severity of impact itself depends on the intensity of the challenge, as well as the vulnerability of the actor. 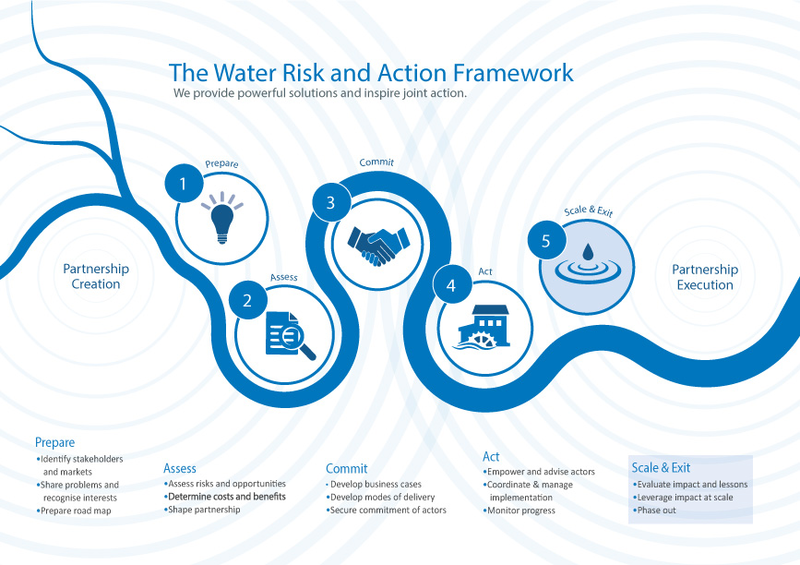 Water risk is felt differently by every sector of society and the organizations within them and thus is defined and interpreted differently (even when they experience the same degree of water-related challenges). 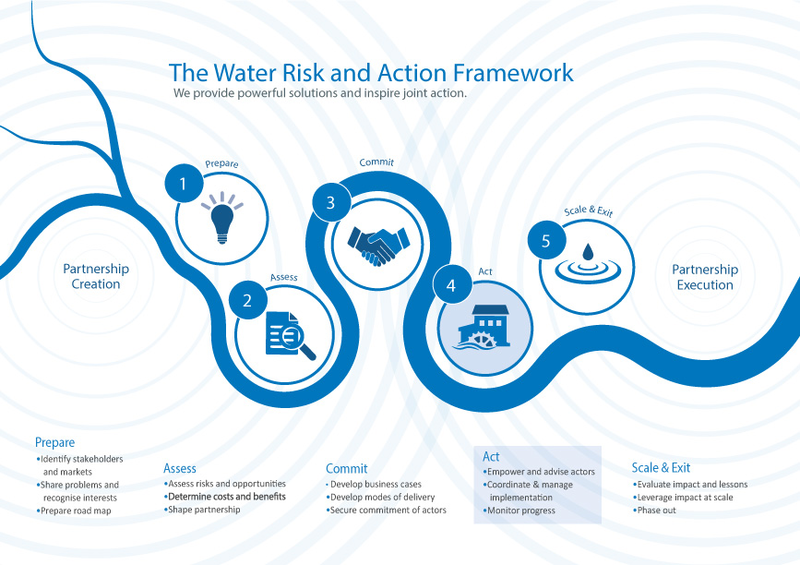 That notwithstanding, many water-related challenges create risk for many different sectors and organizations simultaneously. 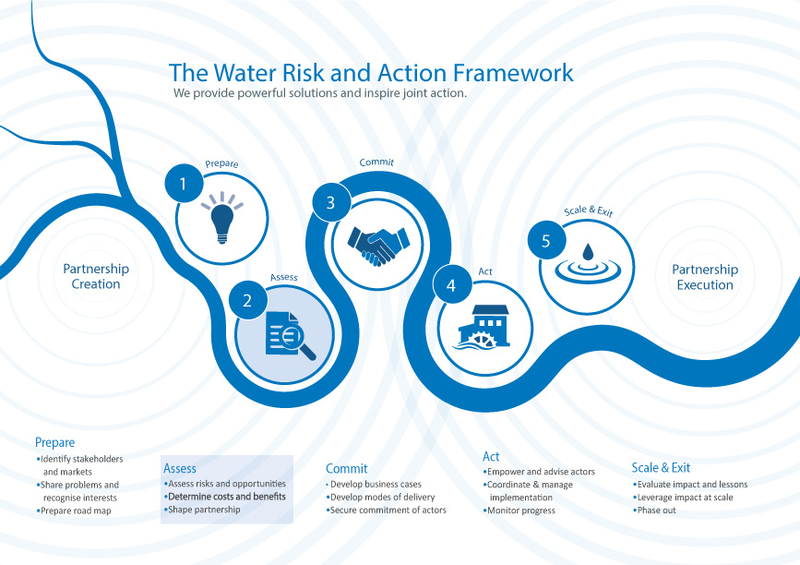 This reality underpins the notion of what some refer to as “shared water risk,” which suggests that different sectors of society have a common interest in understanding and addressing shared water-related challenges. However, some contest the appropriateness of this term on the basis that risk is felt uniquely and separately by individual entities and is typically not shared, per se. Risk due to company operations, products, and services. 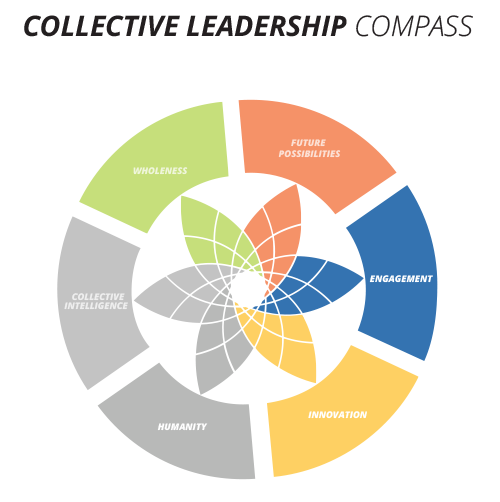 A measure of the severity and likelihood of water-related challenges derived from how a company or organization, and the suppliers from which it sources goods, operate and how its products and services affect communities and ecosystems. Risk due to basin conditions. 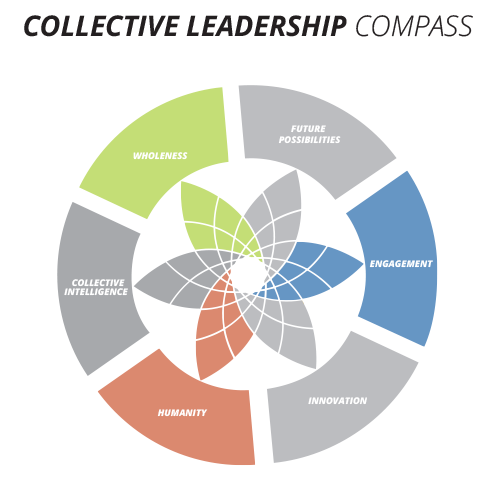 A measure of the severity and likelihood of water-related challenges derived from the basin context in which a company or organization and/or its suppliers from which it sources goods operate, which cannot be addressed through changes in its operations or its suppliers and requires engagement outside the fence. Water scarcity is an indicator of a problem with water availability where there is a high ratio of water consumption to water resources in a given area. Water availability, water quality, and water accessibility are the three components that make up water stress. Thus, water scarcity and additional indicators (e.g., biological oxygen demand, access to drinking water) can be used to assess water stress. Scarcity and stress both directly inform one’s understanding of risks due to basin conditions. 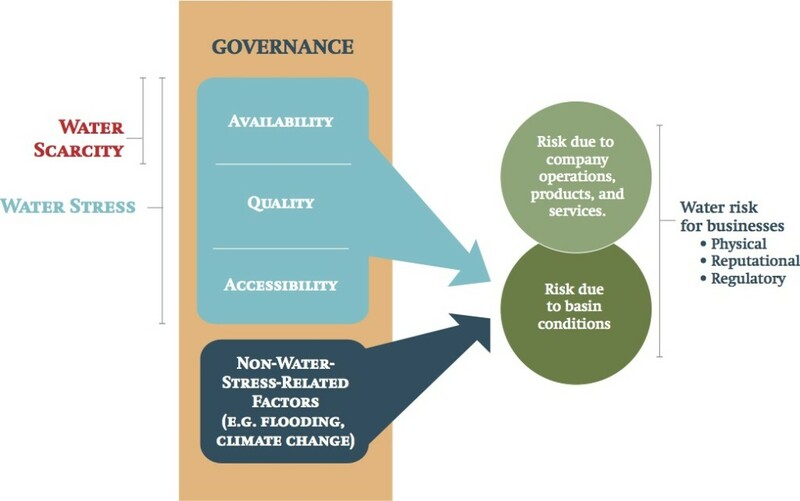 Companies and organizations cannot gain robust insight into water risk unless they have a firm understanding of the various components of water stress (i.e., availability, quality, accessibility), as well as governance and other non-water-related stress factors. The figure above illustrates these relationships.